Ever since reading his book, "How To Survive The End of The World As We Know It", I have been a fan of James Wesley Rawles. His blog, called "Survivalblog.com" is one of the first things I read each morning, after my Bible. His no-nonsense, practical advise on preparing for a socio-economic collapse lends a voice of credence to the maelstrom of "experts" on the subject. The fact that he is an avowed Christian also gives his opinions merit, as far as I'm concerned. In his own words: "As a Christian, I feel morally obligated to assist others who are less fortunate. Following the Old Testament laws of tzedakah (charity and tithing), I believe that my responsibility begins with my immediate family and expands in successive rings to supporting my immediate neighborhood and church, to my community, and beyond, as resources allow. My philosophy is to give until it hurts in times of disaster." But he doesn't mince words when it comes to your responsibility to prepare for your family: "If you are serious about preparedness, then it is time to get out of your armchair and start training and preparing. It will take time. It will take some sweat. It will take money. But once you’ve prepared, you can sleep well, knowing that you’ve done your best to protect and provide for your family, regardless of what the future brings. Don’t get stuck in the rut of simply *studying* preparedness. Unless the shelves in your pantry and garage are filling with supplies, and unless you are growing muscles and calluses, you are not preparing." And that brings me to his latest book, titled "Survivors: A Novel of the Coming Collapse". It is set in the very near future, and The Crunch is in full swing. American society quickly disintegrates after the Federal Reserve's fiat currency collapses. Roving gangs and competing governmental factions result in chaos for millions of people as they struggle with adapting to a "new way" of American life; one that has no use for an industrialized, technological society with no life skills. The protagonist in Rawles's latest novel is a young Army officer, Andrew Laine, who is serving in Afghanistan. 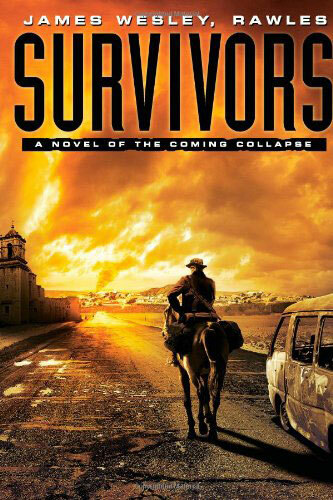 The book relates his travels and trials as he fights his way home to his family in New Mexico from half a world away. In keeping with the author's Christian principles, our hero maintains his moral standards in obviously difficult situations, but is capable of applying righteous violence when necessary to protect his own life or the lives of innocent victims. As with anything written by James Wesley Rawles, the reader will find themselves taking notes, or committing to memory, many of the skills and survival techniques that are portrayed throughout the book. His career in the military; his extensive research on family preparedness and food storage; and his staunch support of the Second Amendment, make him one of the foremost authorities on preparing for a natural or manufactured crisis. And if you are just discovering this wonderful writer, I urge you to also check out his other book, "Patriots". Each of his books will provide you with valuable information and help you adopt a "survivor" mentality, which will serve you well, come what may. My copy of Patriots is dog-eared and highlighted, and I'm still finding new solutions and resources for possible hardships and challenges. And in my first reading of Survivors, two things really jumped off the page at me. (I promise not to spoil the book for you!) The first is how important small denominations of gold will be to barter through dangerous economies. Andrew Laine was able to make his way towards home because of the resources he had, and you should consider them as an essential part of your BOB, as well. Secondly, I realized how deficient my husband and I are in radio communications. You'll have to read the novel, but Andrew is able to communicate and receive intel from the States by employing a little Kaito KX1 transceiver and some wire. And because of reading this book, we now know this is an area we need to work on. Many people (including members of my own family) will avoid these books because they are a scary look into a different world that is fast approaching, and they choose not to confront their fears or the worries of an uncertain future. Or you can choose to face the monster, prepare, and move forward with a moral and godly foundation. Whatever your reasons for exploring these books, read them to take advantage of Mr. Rawles' vast knowledge. And then, like me, if you start out your day seeking knowledge from the Word of God, followed by some practical education from the accepted "survival guru" of our day.....well, you've prepared the best you can. It is an enjoyable book. Here's a couple more Christian prepper authors: Joe Nobody ("Holding Their Own I & II") and Thomas Sherry ("Deep Winter" series: DW, "Shatter", "Remnant", and "Distance"). Their characters hold to Scripture, too. By the way, it is an "Elecraft KX1", not "Kaito KX1". Elecraft specializes in very small but very useful ham radios. Thanks for the reading suggestions and the clarification. I found this book to a terrible read. It was badly written with terrible dialogue. I agree that Mr. Rawles will never win a Literary Award, but the purpose of his books is to teach you something, not engage in scintillating dialogue. If you read them with an eye towards gaining knowledge, i think you will find that they offer valuable advice.